ARP stands for Address Resolution Protocol. It’s a protocol to translate network layer (layer 3) IP addresses to link layer (layer 2) MAC addresses. Why would you need this? Let’s look at a simple example. Here we have a couple of hosts. We need them to communicate with each other and they both have IP addresses on the same subnet. They’re connected to a layer 2 switch. We want to have communication between these two servers over TCP, which is a layer above IP. Remember, layer 2 devices don’t know what IP addresses are! We can’t just say, “hey switch, send these packets to 10.0.0.5.” The switch doesn’t know IP addresses. The switch does speak Ethernet. Our servers are connected to the switch via an Ethernet connection, so they’ll communicate using Ethernet packets. Look, there are “source” and “destination” fields. We’re going to use those. Whenever a host sends an Ethernet packet, it fills those fields in. When the switch receives the packet, it reads the destination field and sends the packet to whichever physical port it needs to go to. It also looks at the source field to remember that the port that it got the packet from has a host with that MAC address. Every switch has a MAC table. This table shows which provides a mapping from MAC addresses to physical ports. The switch adds a MAC entry to its internal table when it recognizes a new address coming from one of its ports. But what if you don’t know the destination’s MAC address? There is a special MAC address, FF:FF:FF:FF:FF:FF, which is a broadcast address. It’s just like a broadcast IP address in a subnet. Any Ethernet packets sent to the broadcast address will be transmitted to every port on the switch. When a host receives a broadcast packet, it’ll know that it’s a broadcast packet because of the destination address. It will also know the MAC address that it came from, because of the source address. In the case of our two hosts, they don’t know each other’s MAC addresses. But that does not mean that they are not able to communicate – they can send broadcast packets! 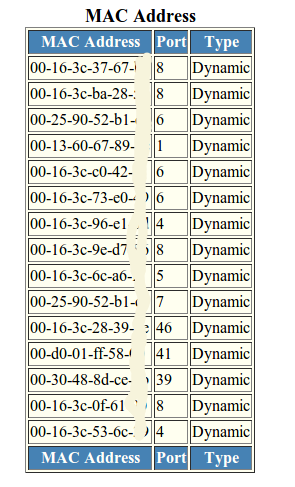 However, this isn’t ideal because they’re not just sending packets to each other, but rather everyone on the network. It’s like trying to have a conversation in the middle of a large crowd. It doesn’t work so well. This is where ARP comes in. Using ARP, we can send a question to FF:FF:FF:FF:FF:FF and it’ll be received by all the hosts on the network: “Who has IP address 10.0.0.5? Tell me, 10.0.0.2.” Now, if someone has IP address 10.0.0.5, they will respond by sending a packet to the MAC addresse listed as the source of the original request. In addition, they now know the MAC-IP pair of the requester! This means they won’t have to send another ARP “who has” request later on. At this point, the two hosts know the other’s MAC address and IP addresses. They can communicate with each other directly! Now, can you think of ways exploit this? Check out broadcast storms and ARP spoofing.